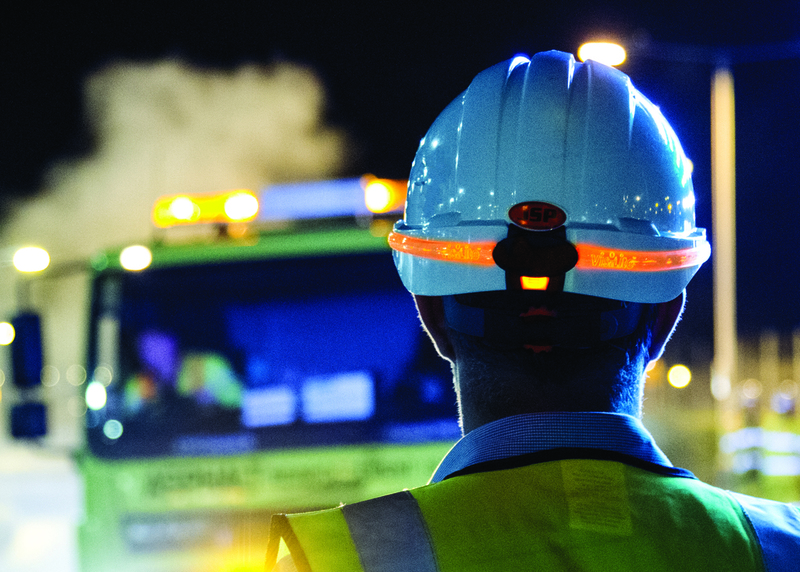 JSP Ltd has launched a new lighting system for its industrial safety helmets called the Visilite. The fibre optic lighting system has been developed as a method of increasing worker visibility without dazzling colleagues in close proximity. The Visilite has tough ABS casings making it highly durable to withstand knocks and scrapes. It is easy to fit to the JSP Evo range of Helmets – clips slide onto the front sides and rear of the helmet to keep it in place allowing fibre optic light to shine all around the helmet. The Visilite offers three lighting modes – static, fast flash or slow flash to suit the user’s needs and is visible up to 50M. LED lights shine low level light down the fibre optic which is refracted by the engraved logos on the flexible optic strip. The unit is USB rechargeable, comes with a Micro USB cable and can be charged whilst fitted to the helmet. JSP’s Research and Department team commented that the Visilite has been developed in reaction to certain customers who wanted to draw attention to their Construction workers to keep them visible on site and when they are travelling back and forth to their working area.